Eat your way through the credit crunch - bring your own booze! £5 bottles of wine in hand we bring you our guide to the best of the BYOs. 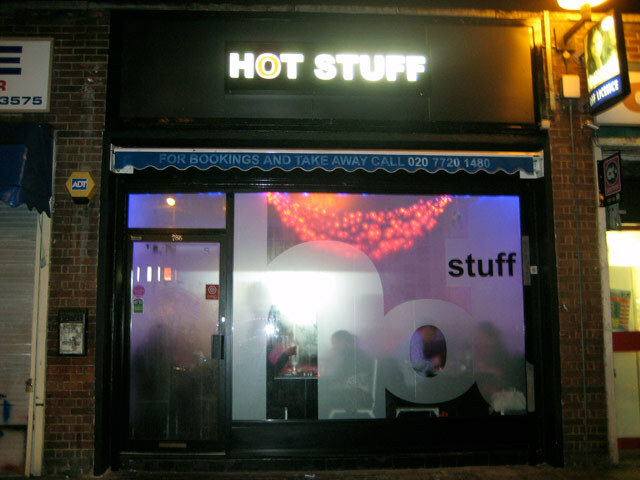 The outfit: As suggested by a commenter, this time we went to Hot Stuff, 19 Wilcox Road London SW8 2XA. Just off the Wandsworth Road a short walk from Vauxhall station. The website is brilliant in its half-madeness. Hear the voice of the gaffer, Raj, all over it. The hours of business: Mon-Fri, midday till 10pm, Sat 3-10pm. Evenings sittings at 7pm and 9pm. Last seating 9.30pm prompt - don't keep Raj waiting. The bottom-line: If you live near enough, you'll want to get your Indian fix here at least once a week. Eat here often enough and you might be absorbed into Raj's extended family and invited to one of his legendary summer barbecues (we're seriously considering a move to SW8). The only drawback is one tiny toilet. But you really won't mind as the gang are friendly, helpful and funny and the food is just ace. 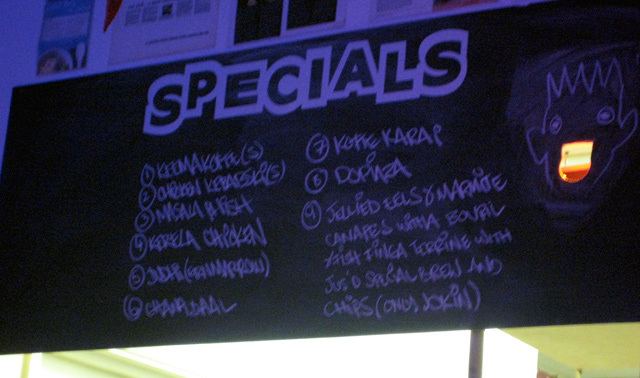 Check out the specials board. We very nearly fell for the "Full English Breakfast" the first time we came here and you'd be forgiven for thinking it could be a mini transport caff, were it not for the walls full of glowing reviews and testimonials and the brilliant aroma of whatever's cooking. The local market: Nada. Hot Stuff sits on a quiet road off the busy Wandsworth Road near the very traditional and wonderfully 'local' Gladstone pub, a convenient offy next door and not much else at all really. 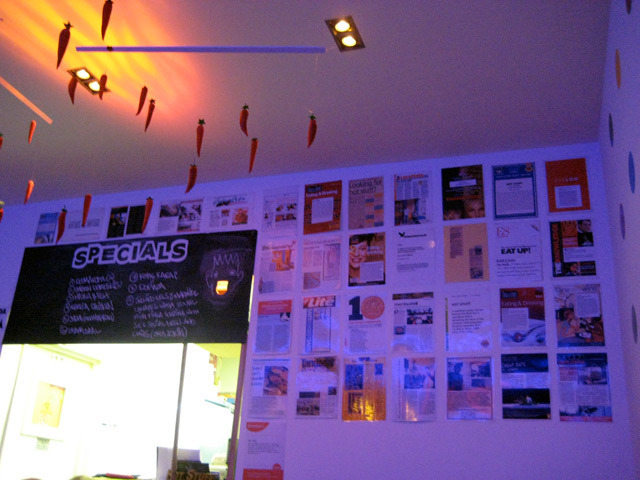 You'll be coming here specifically for Hot Stuff. The bread, chips and gravy: The three of us sat down, cracked our cans of lager and asked Raj to bring us whatever he thought best. Boy did he delight. Poppadoms with what looked like your usual accompaniements but the yoghurty one was spicy, the tomatoey one was wowsers hot, the lime pickly unfrighteningly sour and lovely, mild mango chutney. Soft potato and spinach mixed bhajis, chilli paneer and Jeera chicken drumsticks set us up after, oohing and aahing and licking our fingers. Prawn Masala (juicy), lamb dopiaza (gravy like sauce but totally right) and Kerala chicken (mmmm smoky) came next, with spiced cabbage (wow, yes please) and split pea dahl (tasty and textury) dramatically offset by a freshly made naan bread the size of 2 and a half dinner plates. The invitation to shout if we needed more food was sadly neglected as, man, we were totally hot stuffed. Declining the offer of ice cream we were given it anyway. Purporting to be pistachio and strawberry the green creation with violent red jelly topping was temporarily disturbing but we tucked in gamely, augmenting our distended but delighted stomachs (note to selves: really don't say yes next time - go for more curry instead!). A capital choice for... Everyday. Any day. Delicious Indian food, buzz and bustle, light on the wallet, full of good feelings. 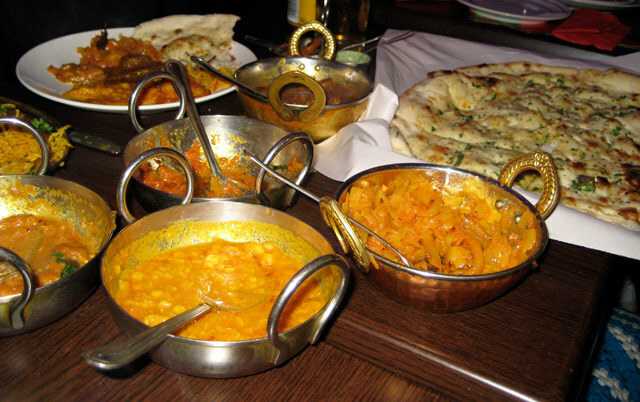 The damage: Three of us dined Raj style for a mere £44. The most expensive dish on the menu is £7.55 - ridiculously cheap for such quality nosh - you can easily eat for a tenner a head. We urge you to go. Say hi to Raj.